The ultimate in summer fun, this White Inflatable Iceberg Water Toy over the water at 14-feet tall. After you reach the summit, reward yourself with a plunge down the slide to the water below. Great for family vacations and summer parties. 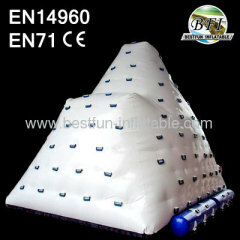 Packing: two layer: soft carpet inside ,PVC outside ,standard export carton for outer packing. 1. We control our quality strictly. 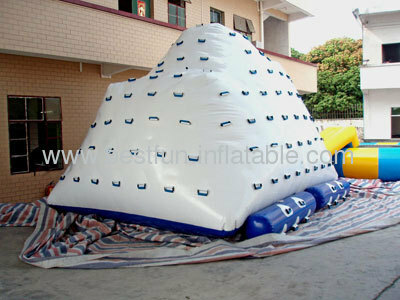 The material for our inflatable is 18oz pvc coated fire retardant tarpaulin, which is known for it's durability, tear strength, and long lasting quality. 2. Doublestitching throughout the unit with triple stitching andquadruplestitching in key areas inside the base of the unit. We useextrawebbing reinforced strip on all the stress points and interiorpanels. 3. We test each product to ensure the toys seamed exactly well before shipping.